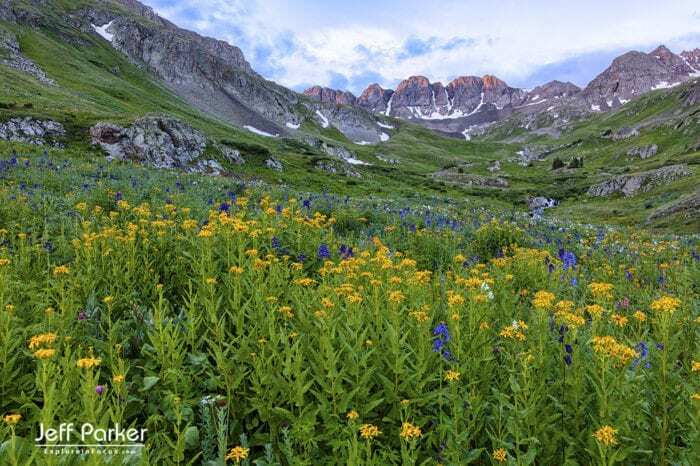 My Colorado Mountain Landscapes & Wildflowers Photo Tour ~ 2019 focuses on capturing beautiful landscape images of the stunning wildflower-filled basins of the San Juan Mountains. These areas above-timberline host the most beautiful landscapes I’ve ever seen (and I’ve seen a lot)! 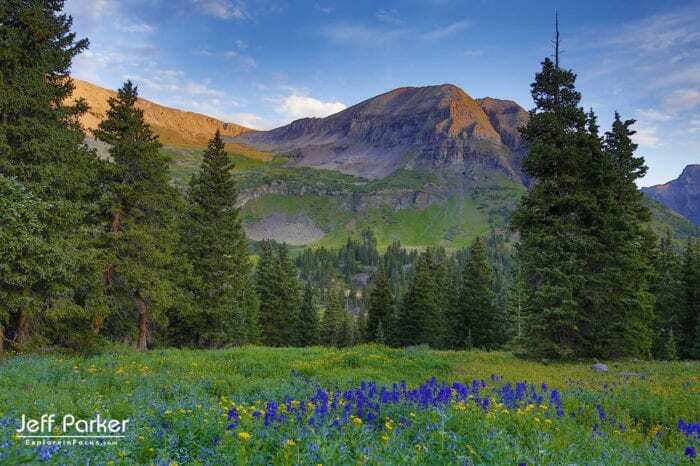 During this photo tour, we base out of Silverton. Silverton’s historic district is a photo-worthy destination in its own right. The town, along with the Durango-Silverton Narrow-Gauge Railroad, was designated a National Historic Landmark in 1961. 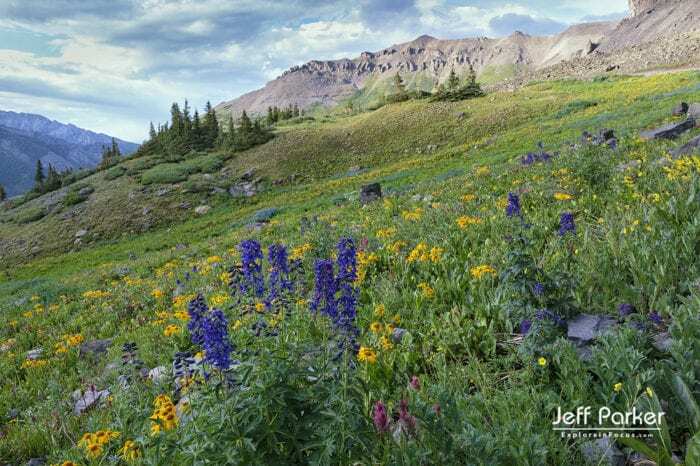 From Silverton we head out daily to let our lenses loose on the petaled gems of these dramatic mountains. For most trails, a standard sedan or SUV will get you to our shot spots just fine. A few locations will necessitate travel over rugged Jeep-worthy trails, but I’ve hired a professional driver in a 4×4 truck to transport us to those hard-to-reach scenic shoots. Throughout the tour, we’ll take our time. No rushing from location to location! We stay at each sweet spot until every person in our group has had the chance to create the images she/he wants. Since skills levels vary so much on photo tours, I don’t typically focus on structured lessons during these events (my workshops, however, are a far different story — they are all about structured instruction). Instead, on photo tours, I tailor my teaching to individual needs. Please do not be shy about telling me what you need. PLEASE NOTE: This is an estimated schedule and we’ll do our best to stick to this itinerary, but certain conditions may necessitate changes. Good photographic experiences will be our goals at all times. We’ll get together for our Welcome Dinner to talk about the upcoming days and get to know one another a bit. Head out before dawn for your first photo shoot. 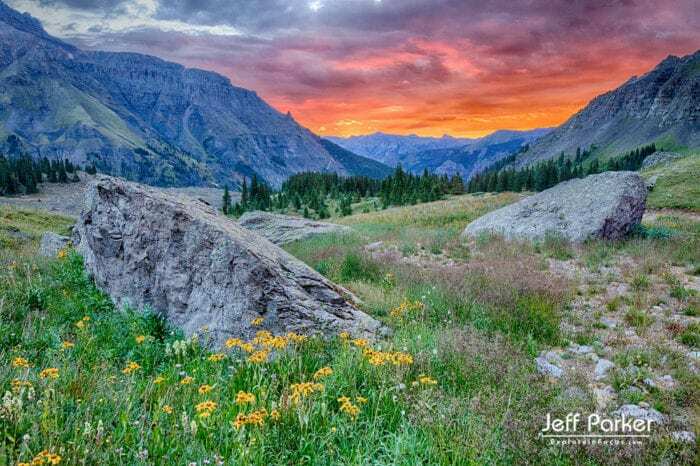 I’ll lead you up into the gorgeous San Juan Mountains to capture sunrise. Return to town for lunch, nap, downloading, image review, etc. Right after lunch we’ll get some shots of the steam train chugging into town. Then, come afternoon, we head back out to the “hills” in time to catch the sweet light. We’ll head out long before dawn so we can nestle into our shot location in the San Juan’s in time for first light. When the light grows too harsh for landscape shots, we’ll focus on portraits and intimate macros of the blooming beauties. We’ll head to Ouray for lunch, finishing in time for our first 4×4 excursion. A professional driver and his 4×4 bring us into the mountains to create dramatic landscapes in the golden light of the setting sun. We’ll be out for a full day of photography fun on an all day 4×4 trip. We’ll break for a boxed lunch in the field & shoot until our light leaves us. Upon our return we’ll grab dinner and head to the ghost town for some night photography. This will go as late as you want. A good night’s sleep is sure to follow. After yesterday’s action-packed schedule we’ll probably sleep in. It will be time to say our goodbyes and collect contact information from our new friends. Three full days of photography. One half day & one full day on in a 4×4 with a professional driver. Fun & camaraderie & new friends! Lodging, meals (except for lunch at our shot location on the 25th), transportation (except for the 4×4 tours – those are included) are NOT included. We’ll drive to all shot locations and the amount of walking you desire to do once we get there will be up to you. None of the shot locations I have in mind will necessitate serious walks or hikes. You’ll need to be comfortable with being in a vehicle on dirt roads. We will be at elevations from 9000 to 12,500 feet. The closest airports are Durango & Montrose. The Durago-La Plata County Airport is 63 miles south (about 1 1/4 hours) of the town of Silverton. The Montrose Regional Airport is about 64 miles north of Silverton. Please plan to arrive at Silverton, Colorado on Monday, July 22, 2019 in time for our Welcome Dinner, which is tentatively set to begin at 7:00 pm. You will want to get a hotel room in Silverton for July 22, 23, 24, & 25th (with check out on July 26th). Vacancies go quickly in July, which is the peak of wildflower season in this region so if you’re considering joining us you’ll want to make sure you can get a room first. This list is not complete. There are a few other motels/hotels as well. NOTE: Be aware that when using Travelocity, Expedia, Hotels.com, etc. they tend to include hotels in Telluride on your list for Silverton and that’s too far away. We’ll send out more info, including packing lists, as your photo tour grows closer. In the meantime, wondering what sort of photography equipment you might need for this tour? 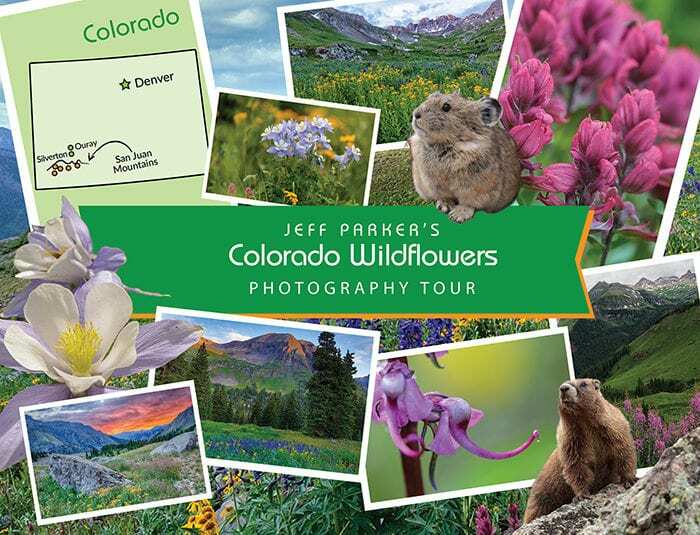 Check out the EQUIPMENT CHECKLIST for COLORADO WILDFLOWERS PHOTO TOUR (PDF). NOTE: You do not have to own everything on the checklist to get good shots of these amazing landscapes! It’s a list of recommended equipment. If you have any questions don’t hesitate to ask! (Follow the provided link in green above ~ or ~ go to link under “MORE” on sidebar to the right.) Thanks!